Each session included a round of “Grace Olympics” with contestants from three different generations. This night, the challenge was to give announcements that included a spiritual truth. Left to right are Sarah Knepper, Columbus, Ohio (emcee); Ken Seyfert, Winona Lake, Ind. ; Rob Borkowitz, Waterloo, Iowa; and Shannon Horst, Dayton, Ohio (all contestants); and Jeremy Byng, Goshen, Ind. (emcee). 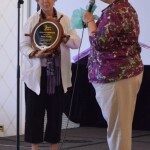 Conference attendees gathered at the Omni Shoreham Hotel, an historic hotel in Washington, D.C.
Chuck and Janice Thornton after he was recognized with the Lifetime Achievement Award by the Association of Grace Brethren Ministers. Terry Daniels, right, presented the Excellence in Ministry Award to Jesús Muñoz at the Association of Grace Brethren Ministers meeting. Pastor of the Year award was given to Jim Brown, left, church planter with Metro Grace in Philadelphia, Pa. Kurt Miller, right, made the presentation. Grace Fellowship Church, Pickerington, Ohio, was recognized with CE National’s Church of the Year Award. Pastor Keith Minier is pictured with Bartley Sawatsky, executive director of the FGBC, following the presentation. Greg Hummel of Auburn, Calif., gets ready to “light up the night” with a key chain light. 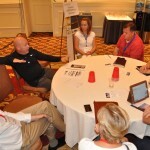 Break-out groups and workshops focused on specific ministries. This one, on “Disaster eMERGENCY Services,” was led by Dan O’Deens, executive director of CPR-3 (in black). 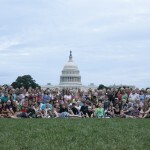 Conference attendees gathered on the National Mall on Saturday night for a group photo in front of the U.S. Capitol. 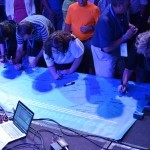 The conference concluded with delegates and attendees signing a Declaration of INTERdependence. With an unwavering commitment to the Word of God and a desire to impact the world for Christ, the national conference of the Fellowship of Grace Brethren Churches (FGBC), FellowShift, concluded as delegates and attendees signed a large banner as A Declaration of INTERdependence. 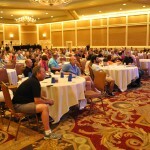 The conference was held July 17-21 at the Omni Shoreham Hotel in Washington, D.C.
Bartley Sawatsky, executive director of the FGBC (and pastor of Grace Community Church, Mississauga, Ontario), had promised a “buzz-generating” national conference and he delivered. 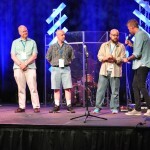 Grace Brethren speakers encouraged, challenged, and taught the conference about shifting attitudes and methods to reach a new generation, and a changing world, with the unchanging message of the gospel. Among the highlights was the all-FGBC luncheon on Sunday where missionaries were commissioned, new congregations celebrated, and a few awards presented. 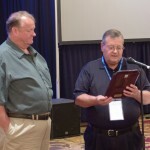 CE National presented its Church of the Year award to Grace Fellowship, Pickerington, Ohio (Keith Minier, pastor) and recognized missionary statesman, Tom Julien, with its Wall of Honor award. The Association of Grace Brethren Ministers recognized their award recipients, who had been honored on Friday during the AGBM annual meeting. Jesús Muñoz, director of ethnic ministries for Encompass World Partners, received the Excellence in Ministry award. 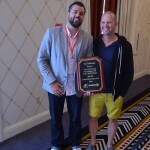 Jim Brown, pastor of Crossroads Community Church, Holmesburg, and director the MetroGrace church planting effort in Philadelphia, Pa., was recognized as Pastor of the Year. 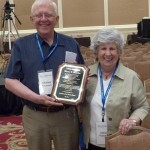 Charles Thornton, longtime Grace Brethren pastor who now resides in Soldotna, Alaska, received the Lifetime Achievement Award. Most of the national organizations sponsored a meal where there were opportunities for updates from that ministry and to conduct necessary business. Encompass World Partners opted to sponsor Engagement Stations, where conference attendees could learn more about ministries around the world and how to engage with mission personnel in those areas. 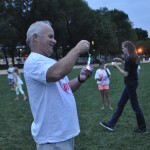 CPR-3, a cooperating ministry, hosted Light Up the Mall – A Night to Remember in front of the U.S. Capitol. Ice cream, water, and light-up gadgets were part of the evening, which included a group photo. 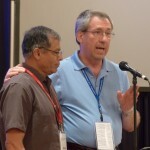 At the business meeting on Monday morning, three new congregations and five cooperating ministries were adopted. Joining the Fellowship was Woodside Church, Ashland, Ohio, Pastor Nathan Wells; Living the Word Church, Mansfield, Ohio, Pastor Andy Shank; and Grupo Amor Cristiano, Dublin, Ohio, Pastor Phil Guerena. Also approved as cooperating ministries were Great Commission Bible Institute, Sebring, Fla.; Vision Alaska, a church planting organization in Alaska; Grace Refuge Outreach Worldwide (GROW), an orphan care ministry in Southeast Asia; Design Outreach, an organization that de- velops water pumps for use in third-world countries; and Metro Grace, a church planting organization in Philadelphia. National conference in 2015 will be held outside New York City with opportunities to go into the city to visit a variety of ministries. Scheduled for July 23-26 and dubbed the Flinch Conference, the event will focus on risk and what God can do when His people step out in faith. This article first appeared in the Fall 2014 issue of GraceConnect. If you’d like to receive the magazine, mailed directly to your home at no charge, click here.